Took a quick trip northward Friday for a strudel and yarn fix, but ended up with a lace and tatting fix instead (and strudel, of course). Village Spinning and Weaving (since it's our local weaving/spinning shop, we just call it John & Marsha's) has about the best supplies of craft books I've ever seen, including an entire shelf on bobbin lace and both shuttle and needle tatting. 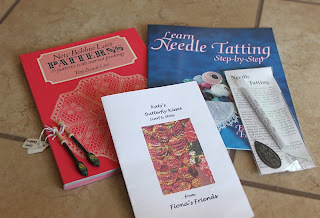 I've wanted to learn tatting for a while now, but getting a needle tatting demonstration at TNNA turned it into an obsession. 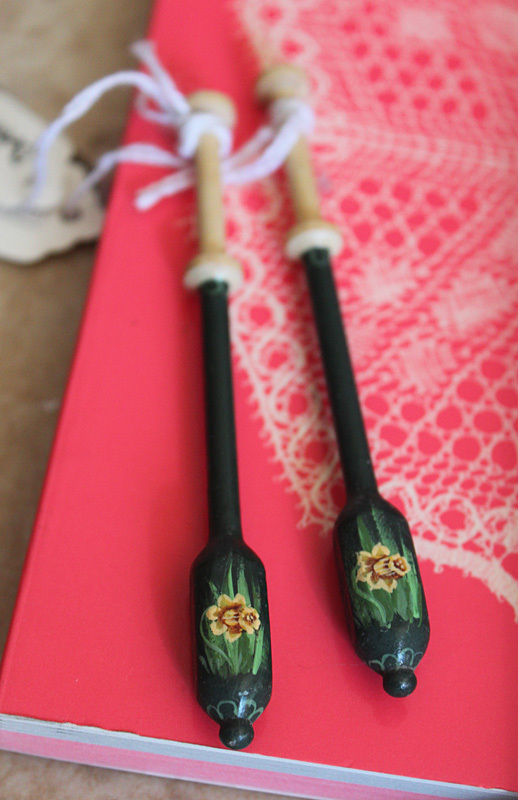 I picked up a how-to book and needle, along with a knitting pattern, bobbin lace pattern book and a pretty pair of hand-painted lace bobbins. Notice what I didn't get? Yep, no yarn or fiber. 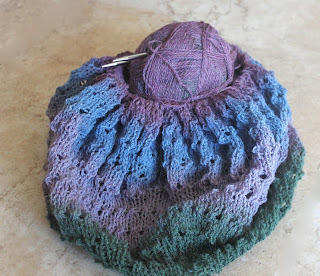 I was really proud of myself for sticking to my goal of use-it-up, aka I have too much yarn to use in six lifetimes. And that feeling of accomplishment lasted until I made just a quick stop at Loop and Leaf in Santa Barbara on the way home . . . . where I picked up this - What makes L&L a must-stop location is the fact that they carry completely different yarns than my LYS, including Habu (stainless steel and silk yarn?? 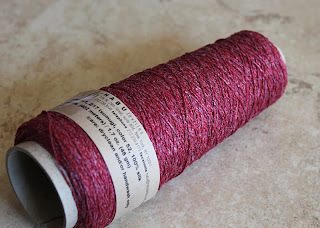 oh, yeah), Kauni, and every color of Madelinetosh Pashmina imaginable. Totally irresistible stuff. And speaking of Kauni - my Pi Shawl is coming along nicely. Only 15 rows to go until I hit the last increase row, which will put my stitch count at 576 per row for the last 60 rows. So, 13,509 stitches down and only 38,880 to go. Almost wish I hadn't figured that out. I saw a needle tat demo at the Houston International Quilt Fest years ago and it was so easy to learn. Much easier than shuttle tat. So easy that I taught myself to needle tat left handed so I could teach my mother! So Enjoy! I just LOVE the colors in this shawl!! !